In a world where humans are a minority and androids have created their own civilization, a wandering storyteller meets the beautiful android Ibis. She tells him seven stories of human/android interaction in order to reveal the secret behind humanity's fall. 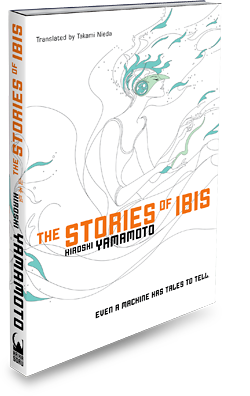 The stories that Ibis speaks of are the "seven novels" about the events surrounding the announcements of the development of artificial intelligence (AI) in the 20th and 21st centuries. At a glance, these stories do not appear to have any sort of connection, but what is the true meaning behind them? What are Ibis's real intentions? A whole bunch of reviews! Who loves ya baby? The DENVER POST, that’s who! Hiroshi Yamamoto was born in 1956 in Kyoto. Began his career with game developers Group SNE in 1987 and debuted as a writer and game designer. Gained popularity with juvenile titles such as February at the Edge of Time and the Ghost Hunter series. His first hardcover science fiction release, God Never Keeps Silent became a sensation among SF fans and was nominated for the Japan SF Award. Other novels include Day of Judgment and The Unseen Sorrow of Winter. Aside from his work as a writer, Yamamoto is also active in various literary capacities as editor of classic science fiction anthologies and as president of To-Gakkai, a group of tongue-in-cheek "experts" on the occult.